THIS SOAP IS SUITABLE FOR BABIES, CHILDREN OR ANYBODY WITH VERY SENSITIVE SKIN OR SKIN CONDITIONS. IT ONLY CONTAINS OLIVE OIL, COCONUT OIL AND FRESH BUTTERMILK. IT IS FRAGRANCE FREE SO IT WILL BE EXTREMELY MILD ON YOUR SKIN AND WILL MOISTURISE AND PROTECT. 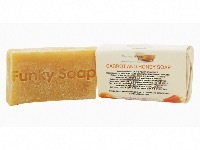 THIS SOAP IS MADE WITH FRESH CARROTS, WHICH CONTAINS VITAMIN A , C AND ANTIOXIDANTS. THESE PROPERTIES HELP REPAIR SKIN TISSUES, SLOWING DOWN AGEING AND PROTECTS THE SKIN AGAINST THE SUNS HARSH RAYS. CARROTS ARE ALSO KNOWN FOR THEIR USEFULNESS WITH UNEVEN SKIN, BLEMISHES AND AGE SPOTS. THE HONEY IN THIS SOAP WILL HELP SOOTHE AND MOISTURISE YOUR SKIN. 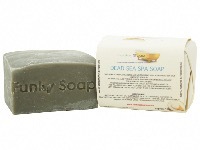 THIS SOAP IS MADE WITH DEAD SEA SALT AND DEAD SEA MUD, IT WILL LEAVE YOUR SKIN FEELING FRESH, CLEANSED AND MOISTURISED. THE SALT AND MUD IS IDEAL FOR DRY SKIN OR SKINS CONDITIONS LIKE ECZEMA. IT ALSO CONTAINS SHEA BUTTER, COCOA BUTTER AND ALMOND OIL LEAVING YOUR SKIN NOURISHED. THIS SOAP IS FULL OF THE POWER OF THE MORINGA TREE. THIS IS AN AMAZING TREE THAT CAN BE USED AS A VALUABLE SOURCE OF NUTRITION AS IT CONTAINS GREAT AMOUNTS OF VITAMINS, MINERALS AND PROTEINS. DURING THE MAKING OF THIS SOAP DRIED MORINGA LEAVES, TEA AND MORINGA OILS WERE USED.